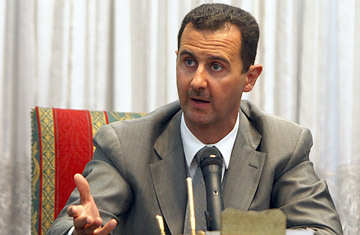 Syrian President Bashar al-Assad speaks during a joint press conference. Syria on Wednesday broke its silence over the recent mysterious assassination of a senior army general and top aide to Syrian president Bashar al-Assad, a killing that has provoked a storm of speculation over internal rifts within the Assad regime. Brigadier General Mohammed Suleiman, 49, was shot dead last Friday at his chalet in the Rimal al-Zahabieh luxury resort nine miles north of the port city of Tartous on the Mediterranean. Press reports in the Arab world claimed that the assassin had fired the shots from a boat out at sea, thus evading security at the prestigious holiday resort regularly frequented by top regime figures. Some analysts, however, suspect that the killer fired from close range  they note the fact that Suleiman was hit in the head, neck and stomach, and also the difficulty of firing that accurately from a bobbing boat. The slain general was buried on Sunday at his home village of Draykish, 15 miles east of Tartous, in a funeral attended by Maher al-Assad, younger brother of the President. Bashar al-Assad, who is said to be deeply upset by Suleiman's murder, stuck to his schedule and flew to Tehran on Saturday for talks with top Iranian officials, followed by a trip to Turkey. And the government initially remained silent on the assassination, while the Syrian media ducked the issue. But on Wednesday for the first time, Buthaina Shaaban, an advisor to President Assad, confirmed Suleiman's death. "Mohammed Suleiman, an officer in the Syrian Arab Army, has been assassinated," Shaaban told reporters. "An investigation is underway." She offered no further details. As for the identity and motive of the killer, there is no shortage of speculation in Syria. Nicknamed "the imported general" by his friends because of his fair complexion and foreign looks, Suleiman had been a key aide to Assad since the mid-1990s, when Bashar was being groomed to succeed his father, Hafez al-Assad, as president. Suleiman, who comes from the same Alawite religious sect as the Assad family, supervised several portfolios, and oversaw Syria's weapons research and development program. After Assad became president in 2000, Suleiman handled his intelligence affairs and was reportedly also in charge of arms transfers from Syria to Hizballah in neighboring Lebanon. Suleiman's murder comes at a critical time for Syria, which is presently engaged in a delicate balancing act of pursuing indirect peace talks with Israel and improved ties to the West, at the same time as maintaining its relations with Hizballah and Iran. In exchange for the return of the Golan Heights, captured by Israel in 1967, the Israeli government demands that Syria curtails its strategic alliance with Iran and its backing for Hizballah and for Palestinian militant groups. Still, since Syria and Israel revealed in May that they are negotiating via Turkish mediation, Damascus has paradoxically strengthened its military and economic alliance with Tehran. Some Syria watchers believe that while Assad has a firm grip on power, the pressure of juggling relations with Israel and Iran is causing stresses within the regime. "There is talk now about moving to direct peace negotiations between the Syrians and Israelis, but it's hard to reconcile those talks when Syria's military and security apparatus is so heavily supported by Iran," said Andrew Tabler, a Damascus-based Syria analyst. "I can't imagine how they are going to square all that." A well-informed Syrian source told TIME that Suleiman's death could be connected to the fallout surrounding the assassination in Damascus last February of Hizballah's top military commander, Imad Mughniyah, who was killed by a car bomb. Regime insiders indicate that the Mughniyah killing, which caused the Syrian leader serious embarrassment with his Iranian and Hizballah allies, touched off a purge in the senior ranks of Syria's intelligence services. Some speculate that these purges may have created a revenge motive for Suleiman's killing. "It's a very delicate question. I think that how the regime reacts to the assassination will be more significant than the assassination itself," the source said. Ultimately, the truth may turn out to be much simpler, or perhaps even more convoluted than the most convoluted conspiracy theory. With Syria, you can never tell.